The show opened with a video package on Daniel Bryan, focusing on his Tweet from earlier today where he announced he was retiring during the show. Nice video, although a tad short. The show opens with Stephanie McMahon in the ring. There is a table set up in the ring Cole also notes how we will hear from Bryan later on in the show to announce his retirement. Stephanie attempts to speak but a chant for Bryan breaks out through the arena. She let them chant for a minute before saying the winner of the Fastlane main event will not go on to face Bryan but rather her husband, HHH. Dean Ambrose comes out and issues a challenge to Brock Lesnar. Stephanie reminds him she makes the rules for the official signing but is interrupted by Roman Reigns, who comes out to ask Stephanie “what’s the hold up” and that we should sign then let Ambrose take on Lesnar. Stephanie counters by making a comment about how Reigns always steals Ambrose’s spotlight before bringing out Brock Lesnar. A feint “suplex city” chant breaks out before Heyman grabs the mic. Stephanie cuts him off, drawing boos from the crowd, and orders the guys to sign the contract. They all sign as Stephanie leaves, saying her business is done. Heyman then calls Ambrose “Little Brother” and to ask his “Big Brother, Samoan Badass” what’s it like to go into battle with Lesnar. Ambrose gets in Lesnar’s face but Lesnar tosses him over the table at Reigns. Lesnar then hits Reigns with the table in the corner before hitting Ambrose with an F5. Lesnar and Heyman head up the ramp but HHH comes out, with his wife, as he has the belt over his shoulder. HHH and Lesnar stare each other down as Cole brings up what is at stake at Fastlane. I liked the segment as it put Lesnar over as a monster and Ambrose over as the babyface who refuses to back down. Reigns was there too, standing out the least of anyone involved. Cole reads Daniel Bryan’s Tweet where he announced his retirement as it appears on the screen leading to a plug for his retirement speech. We get a Daniel Bryan moment where he made his debut on NXT against Chris Jericho. Ambrose and Reigns are backstage. Ambrose tells Reigns before this night is over, he is going to get revenge on Lesnar. Owens attacks Ziggler before the bell. He hits the Cannonball in the corner for a nearfall then hammers away. Owens yells at Cole to shut up as he is kicking and stomping Ziggler, who manages a quick rollup for two. Owens clotheslines him down then hammers away. Ziggler floats over on a slam and jumps on Owens’ back for a sleeper. Owens breaks it up by going through the ropes as we head to break. The action returns with Owens missing a charge in the corner. Ziggler comes back with a pair of clotheslines and a neckbreaker. Elbow drop gets two. Owens blocks a jumping DDT attempt and hits a super kick for a nearfall. Ziggler escapes a Pop-Up Powerbomb as Owens rolls him up for two, while holding the tights. Ziggler plants Owens with a DDT as Ziggler fell outside. Owens is hanging over the apron as Ziggler takes him off with a Fameasser, clutching his shoulder on the landing. Both men roll inside to beat the ten count as a “Fight, Owens, Fight” chant breaks out. Owens misses a cannonball then Ziggler rolls him up and puts his feet on the ropes and gets the win (11:03) **3/4. After the match, Ziggler celebrates in the crowd as Owens destroy the announcers table and tosses the stairs. Cole lets us know that the New Day vs. Usos will take place in a Tables Match, with the Tag Titles on the line. Also, Chris Jericho will be the guest on Miz TV. We get another Daniel Bryan moment, this time Bryan defeating the Miz at the 2010 Night of Champions PPV to capture the U.S. Title. Backstage, the Usos are putting on their face paint. The Dudley Boyz walk in and say that if anyone deserves a Tables match for the title, it is them. The Dudley Boyz then talk about teaming up with the Usos to face the New Day in a Tables Match and will try to make the match happen. They leave as the Usos nod their heads in approval, seemingly okay with no longer having a title shot tonight. We get a video package on the Ryback. After that, its announced that he will be facing Bray Wyatt tonight. Cole lets us know that Brie is here but with her husband, Daniel Bryan. Charlotte dropkicks Alicia then escapes from a waistlock but fails to apply the Figure Eight. Alicia hits a dropkick then a Northern Lights suplex for a nearfall. Charlotte drops Alicia with a hanging neckbreaker then stomps away in the corner. Charlotte hits Alicia with a clothesline then continues to work the neck of Alicia while taunting the crowd. Alicia comes back with a pair of dropkicks and a tilt-a-whirl backbreaker before screaming to the crowd. Charlotte comes back with a neckbreaker and shortly after that gets the win with the Figure Eight (5:11) *1/4. Thoughts: Alicia tried and showed some fire but the match was really sloppy overall. Charlotte’s heel work continues to improve on a weekly basis as well. We learn that the Dudleyz & Usos will face the New Day and a partner of their choosing in a tables match tonight. Miz TV is up now. Miz says this is a place where everyone can look and feel awesome. He then brings up AJ Styles attacking him last week as we see a clip of that. Cole noted that the “pitbull attitude” of AJ came out in that segment. Back to the show as Miz notes he could have done what he did for Bryan with AJ. Chris Jericho comes out as the announcers plug his match against AJ on Smackdown this Thursday. Jericho lets us know they have some “crazy” people here tonight before ragging on the Miz. Jericho said that no one wants to see Miz TV and that all of the Jericholoics at home want to see the Highlight Reel as the production crew switches this all over to the Highlight Reel set. Miz is pissed, saying its his show and “none of this is right.” Jericho then said something is missing…his potted plant, which is placed on top of a stool. Jericho mocks Miz for getting his teeth knocked out by AJ on Smackdown as we see a slo-mo of that, with a tooth flying in the air. A “you look stupid” chant breaks out as Miz says he cannot possibly look stupid because he is not Sheamus. Miz claims he paid $10,000 to fix each tooth and almost had to miss his meeting with Steven Spielberg as Jericho is laughing in the background, trying to lead the crowd into singing “All I Want For Christmas is My Two Front Teeth.” A giant “yes” chant breaks out as they mock Miz. However, Miz brings up how AJ beat Jericho on RAW two weeks ago as we see a clip of that. Jericho is not happy about that and says he has not stopped thinking about it for two weeks as a chant for AJ Styles breaks out. Jericho says we all know AJ is good but wonders if he is great, having what it takes to beat him twice. AJ comes out and as that happens Miz attacks Jericho from behind. AJ comes in to get rid of Miz then stares down Jericho. Miz runs back in as both guys toss him out then Jericho and AJ stare down then eventually come to blows. Miz drags out Jericho and gets tossed over the announcers table as a result. Jericho stares down AJ from the floor as AJ’s music plays. I thought this was another good segment. Miz’s mic work has been superb the past few weeks and the slow turn for Jericho, which I assume is the direction this is going, is being teased well. Its too bad for Miz that he is clearly positioned below these two on the card though. We see Ambrose pacing around backstage as Cole wants to know what is going through his mind. Another Daniel Bryan moment, this time winning the 2011 Money in the Bank Briefcase and then cashing it in at 2011 TLC to win the title. Wyatt wins a slugfest to start. Ryback comes back with a big boot then hits a shoulder tackle. Slam gets two. Ryback heads up top but gets down as the Wyatt Family stared him down, allowing Bray to hit a sneak attack from behind as we go to commercial. The match returns with Ryback fighting out of a chinlock. Wyatt hits a clothesline but misses a charge in the corner. Ryback hits a pair of running knee strikes in the corner then hits a crossbody before firing away. He gets a nearfall with a spinebuster as the camera pans to Braun Strowman. A “feed me more” chant breaks out but Wyatt blocks a Meathook attempt and hits the Sister Abigail for the win (6:51) *1/2. After the match, the rest of the Wyatt Family attack the Ryback. Strowman then sloppily rolls Ryback outside before sending him into the steps. Wyatt then hits another Sister Abigail to the floor before going off on a tangent before declaring that the apocalypse has just begun. Thoughts: The action was fine for what we saw, which wasn’t much. The Ryback video from earlier I assume was an attempt to build him up for fodder against Bray. One bad thing here was Strowman’s beatdown on Ryback after the match. It looked like anything but vicious. He needs to improve at a quicker rate. We get another Daniel Bryan moment, this time a video montage of his Team Hell No partnership with Kane. They really made a great pair. Backstage, Big E is singing while polishing a table. Kofi and Xavier talk about what spot to use to put people through the table. Renee Young comes in and asks if they have found a partner but they said not yet but they will find one. Reigns suggests to Ambrose that they attack Lesnar now but Ambrose does not want his help as he wants revenge. Reigns asks if this was due to what happened on Smackdown while Ambrose said its just about getting revenge on Lesnar. They are planting the seeds of dissension between these two. Before the match, the Outcasts argued over Rose’s nickname “The Radical Mongoose,” but agreed that Titus would be defeated. The match starts with Rose slapping Titus, who slaps him down in return. Rose gets tossed across the ring then Titus chops him repeatedly in the corner. Titus misses a charge then gets hit with a dropkick. Rose chop blocks Titus before applying a sleeper as a Seahawks chant breaks out in the crowd. Rose tries an Irish whip but Titus blocks that and tosses him across the ring. Titus hits a few backbreakers then tosses Rose aside. The crowd does the Gator Bark with Titus but the Outcasts yank Rose outside. Titus runs through them on the outside but gets distracted by Slater on the apron then Rose gets the win with a rollup (3:13) 1/2*. Thoughts: The match was nothing and I have no idea what they are building up the Outcasts for at the moment. Maybe the rumors of Enzo & Big Cass being called up will result in a feud between these two? Another Daniel Bryan moment, this time Daniel Bryan defeating John Cena for the WWE World Title at 2013 SummerSlam. They did not show Randy Orton sneaking in to cash his MiTB Briefcase and winning the title. We get a brief photo montage of African-American superstars from the past. Ambrose heads out to the ring. He tells Lesnar what he gave him earlier tonight couldn’t have been an F5, as it did not hurt or keep him down. Ambrose then tells Lesnar to come out and try it again but this time “put some stank on it.” Ambrose then taunts Lesnar about Suplex City going soft, much like HHH said last week. Ambrose continues to insult Lesnar, even going as far as to say he did not realize Heyman “held his balls.” Lesnar’s music hits and he comes out with Heyman. Lesnar is laughing but Ambrose runs up the ramp and tries to attack him. Lesnar proceeds to destroy Ambrose, tossing him around like a rag doll. Lesnar rolls Ambrose inside the ring and flattens him with a clothesline. Ambrose gets up but Lesnar puts him right back down then hits an F5 and walks off as Ambrose his down on the mat but rolls over and motions for Lesnar to return. Lesnar heads back in as Ambrose can barely stand. However, Reigns comes out and stares down Lesnar from the ramp as we get a goofy camera angle on that. Ambrose then hits Lesnar with a low blow from behind and heads up the ramp, walking by Reigns, telling him he could take care of Lesnar. Ambrose then falls down on the ramp and yells out in pain. Again, they made Ambrose look fearless and it comes off great. And on the flipside, they make Reigns look like some guy who is involved somewhat in a feud between Lesnar and Ambrose. We get a replay of Lesnar destroying Ambrose. Sin Cara and Rusev mix it up to start as Saxton notes Sin Cara is proud of his partner for winning the U.S. Title. Rusev takes control as we get a chant for Lana, who is not here, from the crowd. Rusev drills Sin Cara with a roundhouse kick to the back of the head before tagging out as Del Rio works a chinlock. He hits a German suplex for two then chases Kalisto off of the apron. Sin Cara comes back with an attack then tags Kalisto, who cleans house. Sin Cara flies out with a tope to take out Rusev. In the ring, Del Rio blocks a Salida Del Sol and tosses him up top. Barrett distracts Kalisto and that allows Del Rio to hit his stomp for the win (6:11) **. Thoughts: Good action while it lasted. Also, the Del Rio/Kalisto feud appears to be far from over. With Sin Cara back, I do not know what his role will be going forward and if Kalisto will team with him any longer. We are shown a clip take took place earlier today. R-Truth is on the phone and runs into Goldust, who is dressed up like Jimi Hendrix. Goldust pretends to sing like him, mixing in the tourettes, but smashes his guitar and gets dragged away by security. This was a waste of time and much less entertaining than their other segments. Another Daniel Bryan moment, this time the Occupy RAW segment from 2014. We get a clip of Team BAD turning on Sasha Banks last week. Sasha Banks is on commentary. She states she is scouting Becky, to make sure she can do more than an “arm drag” and knows she needs help against Team BAD as they are having a tag match at Fastlane. Becky bridges out of a pin then hammers away. She applies a sleeper but Tamina backs her into the corner. Becky sidesteps a charge but gets distracted as Tamina hits a clothesline. Tamina chokes Becky out with the ropes then Naomi lands a cheapshot. Tamina hits a running chop for two. Tamina lands a headbutt then yells and points at Sasha, who stands up and heads over. Naomi drills Sasha then tosses her into the steps. Becky runs out to beat on Naomi and suplexes her but gets met with a super kick when she runs back inside and Tamina covers for the win (3:40) *1/2. Thoughts: The action was fine. On commentary, Sasha still acted heelish and they barely acknowledged her team with Becky in NXT. The match did a good job at building up their PPV match at Fastlane. Backstage, New Day are talking to someone off camera. They give them a unicorn horn and the camera pans and shows Mark Henry, who accepts then plays the trombone while Xavier looks on in disgust. Big E and Kofi then dance with Henry, who does the Dougie as we head to commercial. We are shown various tweets from WWE Superstars regarding Owens. Henry comes out to the ring dancing while wearing a unicorn horn on his head. Match starts with the Usos and Dudleys clearing the ring as the crowd is going nuts with a tables chant as we head to break. We return with the New Day and Usos in control. Henry cleans house but yells at the New Day when they want him to put someone through a table as he leaves. The New Day yell at him but get attacked from behind then hit with stereo Wassup Drops. D-Von gets the tables but the New Day fight back. However, the Usos have their own super kick party then attempt to put Xavier through the table but Big E breaks that up. However, Big E gets stunned and the Dudleys put him through a table with a 3D for the win (7:30) **. After the match, the Dudleys yell at the New Day then turn on the Usos. They put Jimmy through a table with a 3D then Bubba powerbombs Jey off of the top rope through another. Thoughts: The match itself was alright but the big story here was the heel turn by the Dudley Boyz. Bubba was great as a heel in TNA and if allowed to act like that here, it could make for great entertainment. However, the Usos are a stale act that the fans care less about with each passing week and when the Dudley Boyz attacked them, it mostly drew cheers from the crowd. That minimizes the heel turn aspect when you attack a face team that the crowd does not care about. 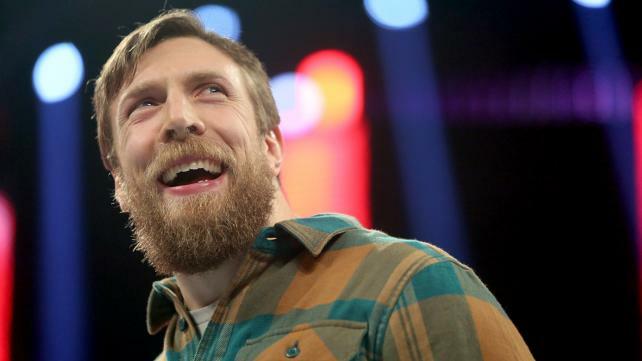 We get a video tribute to Daniel Bryan. It was an excellent video, highlighting his WWE career and a brief shot of him on the independent scene. Bryan now comes out to the ring. He does his ring entrance then stops before entering the ring to look at the crowd. He heads up top as Cole plugs Bryan’s interview on SportsCenter at 9pm EST tomorrow night. The announcers are all shown standing and clapping. He stands in the ring as the crowd erupts into chants of his name. Bryan looks choked up but manages to smile as he looks around at everyone. He finally speaks as he says he was able to close his eyes and just feel and experience the chants, talking about how he will never forget this moment. Bryan talks about cutting his beard because he got a haircut and it looked goofy. He plugs a “Wigs for Kids” charity then mentions how he doesnt want to be doing this either, referencing the crowd’s “no” chant as he was about to announce why he is retiring. Bryan talks about wrestling for sixteen years and had suffered three concussions within his first five months. Bryan then talks about getting other concussions over the years and it all added up. Bryan goes into training and getting checked out in order to be able to wrestle, even keeping in shape if the WWE called him to come back. Bryan talks about loving wrestling as the crowd thanks him. Bryan then mentions taking a test over a week ago and realized is brain might not be as okay as he thought and with a family to think about and wanting to have kids, he will officially announce his retirement. He talks about feeling all of the emotions leading up to that decision but today, he woke up feeling happy for getting the chance to do what he loves for the past sixteen years. Bryan tells us what he loves, which are the Seattle Seahawks, the fact his entrance music brings him joy, performing topes, the fact he wrestled in gas station parking lots and in front of 70,000 at WrestleMania. He then talks about some of the guys in the company he has been glad to meet, such as Kane and William Regal. He then talked about meeting children, like Connor Michalek, who are stronger than he could ever be. Bryan then talks about the fans getting behind him, mentioning how at just 5’8 and 190lbs he had their support and that makes him feel grateful. He then talks about the fans hijacking RAW, prompting the crowd to break out in a “Yes” chant. He then gets choked up talking about how great his dad felt seeing him get those chants in person, for the last time, and feels grateful for that. He talks about wrestling allowing him to meet his wife and to announce his retirement in front of a bunch of people who love him, like his mother, sister, and the rest of his family and friends. Bryan then talks about starting a new life tomorrow morning as a non-wrestler but this is his last night to feel this energy and asks for one last “Yes” chant. Brie comes out and kisses Bryan in the ring as Cole closes the show by saying we are all grateful to have Bryan and to listen to more on this by watching the WWE Network. A truly amazing segment. First off, Bryan comes across as the most humble star in wrestling history. The speech was passionate, funny, and when he talked about his concussion history, it was even scary. One of the better speeches you will ever hear, even outside of wrestling. At just 34 years of age, he admitted to having so many concussions throughout his career that he realized continuing to wrestle would be detrimental to his well being. Regardless, its great for Bryan to go out on a high note, in front of his home crowd with a wonderful celebration. Final Thoughts: This show was all about Daniel Bryan and his career. It was the theme of the night and a wonderful showcase of his talents and WWE run. For this, the show was awesome. The crowd was hot all night long as well. Regarding the Fastlane PPV, which is in two weeks, they did a good job at promoting the main event and the Divas tag match but that was all. I really liked the Miz TV/Highlight Reel segment as that will likely result in some sort of PPV match. The Dudley’s heel turn was not that effective due to them turning on a team the fans seem to be sick of seeing. Nothing was terrible tonight at least and the celebration of Bryan, a theme throughout the whole show, made things breeze right by.